20 cm xlv, 249 p.
'She had been forced into prudence in her youth, she learned romance as she grew older - the natural sequel of an unnatural beginning. 'Anne Elliot seems to have given up on present happiness and has resigned herself to living off her memories. More than seven years earlier she complied with duty: persuaded to view the match as imprudent and improper, she broke off her engagement to a naval captain with neither fortune, ancestry, nor prospects. However, when peacetime arrives and brings the Navy home, and Anne encounters Captain Wentworth once more, she starts to believe in second chances. 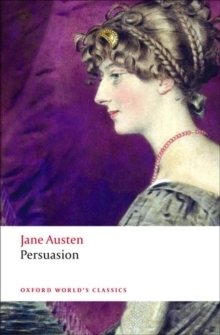 Persuasion celebrates romantic constancy in an era of turbulent change. Written as the Napoleonic Wars were ending, the novel examines how a woman can at once remain faithful to her past and still move forward into the future. Each affordable volume reflects Oxford's commitment to scholarship, providing the most accurate text plus a wealth of other valuable features, including expert introductions by leading authorities, helpful notes to clarify the text, up-to-date bibliographies for further study, and much more. .